April - Sakura is starting to bloom! Beautiful month for beautiful you. What's up, sweeties? It's been awhile since I started to focus on my real life. I'm still struggling, I hope you have nice days ahead! Right now, I want to talk about mask that I really love. Honestly, it looks like the mask from facial treatment on many beauty centers, so It's really fascinating! It's modeling mask, yup it's rubber mask. Modeling Rubber Mask is a mask that have a rubber feel texture. No, it doesn't contain any rubber or plastic. It's kinda thick and it is a peel-off mask. This would be my first ever modeling mask. 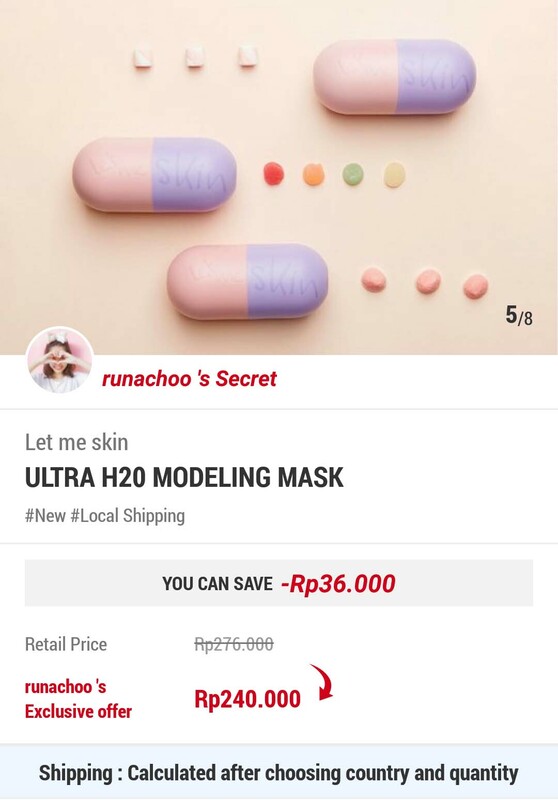 Ladies and gentlemen, please welcome "Let Me Skin Ultra H20 Modeling Mask"! 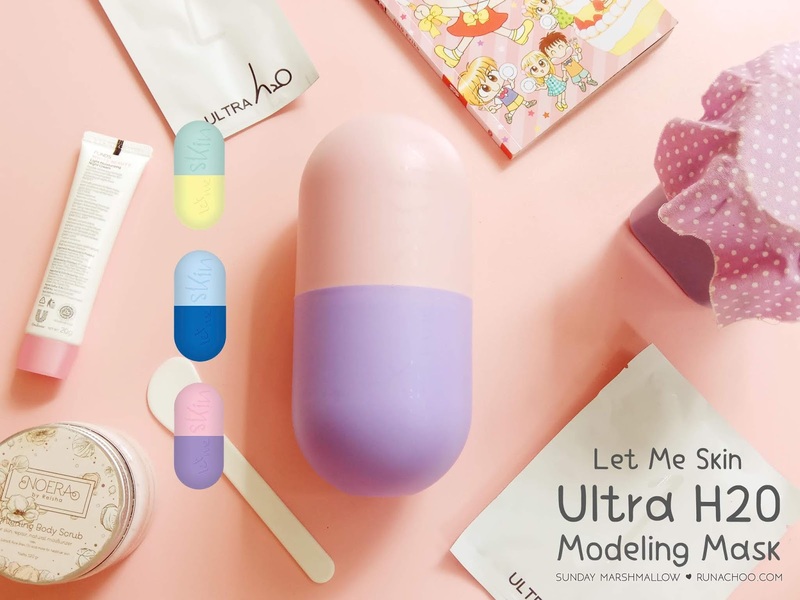 Let Me Skin is a skincare brand from Korea. As you know, Korea is a home for skincare. The green one is for soothing, protection, and nutrition. The essence contains asiatic pennyword extract and chamomile extract to make your irritated skin soothed and moisturized. The blue one is for moisturizer, elasticity, and enhanced coating. The essence contains hyaluronic acid, caviar extract, and green tea extract that will moisturize, nourish, and maintain skin elasticity. The pink one is for brightening, vibrance, and enhance brightness of your skin. The essence contains licorice extract which can help brighten dull and dark skin and green tea extract to revitalize exhausted skin. Because I have a dull skin, I decided to pick the pink one. Let's discuss this a bit more, shall we? What are the other ingredients inside the pink essence? Licorice Extract, I think everybody is already familiar with this. Licorice is usually used to help brighten skin. Ginger Extract to nourish your skin. Schizandra Chinensis Fruit Extract that helps you maintain skin balance. Green Tea Extract to revitalize exhausted skin. Rice Bran Extract is used for radiance, moisturizing, and brightening your skin. Lime Extract contains much of vitamin C which is good for vitalizing the skin. Rosa Centifolia Flower Water for brightening, soothing, and vitalizing. There's some information at the back of the packaging. The minus is, all of the information written is in hangul, Korean. I don't understand Korean at all. Okay, I should admit I know few words like 사랑해 and 안녕하세요, but those phrases aren't related to beauty LOL But hey, you can use google translate! Just snap a photo of it and translate via google translate app on playstore. Ultra H20 Modeling Mask from Let Me Skin has a really cute packaging - yet very creepy because this reminds me of medicine (LOL) Yup, it looks like a capsule! Let Me Skin has a really good reason for choosing this shape! 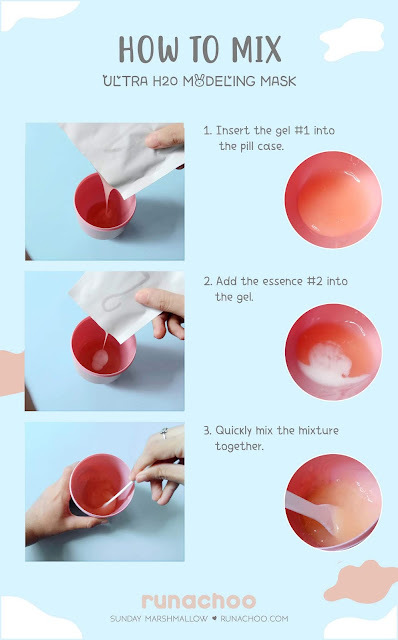 You can use this as the mask bowl and after using the mask, you can make this half capsule as pencil case or something-case, hehe. There are 2 sachets of gel #1, 2 sachets of essence #2, and a spatula. 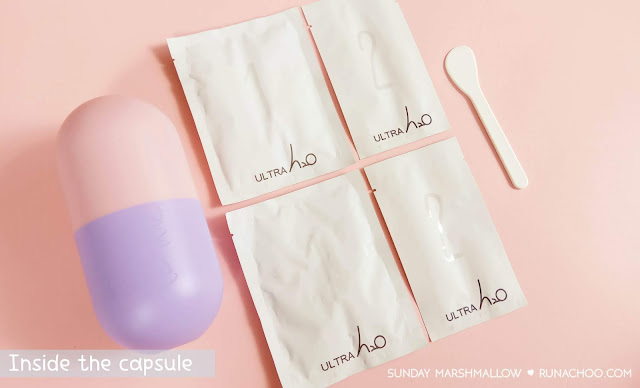 You must combine #1 with #2, so you have 2 masks per capsule you bought. At first, I was really excited that I could use the capsule as its bowl. It's much easier that I don't have to use mine. -wait, this capsule is also considered as "mine" lol what do you mean, Ruby -_- It's really efficient! And it also provides spatula! HAHAHA SO HAPPY. The gel #1 is peach colored and the essence #2 is white colored, when you combine those, the color looks even prettier and softer. The smell is also very fresh, but also not too fragrant. The texture is like gel and not sticky. When being applied, it feels super duper fresh and fresher if you put the sachets into the refrigerator first before using (Please don't mix it first). I waited for 30 minutes and the texture changed into rubber gel feels. Because it was thick, it's easier to be peeled off! The result is my face feels soothed, revitalized, refreshed, and moisturized. It claims that can make your skin brighter, but I think not in one shot usage. To get brighter skin, you must use this mask routinely. Remember to use other skincare that has brightening effect, this mask is only a lil step of many steps you can try to brighten your dull skin. - I got 2 useful cups and 1 spatula! Yes, if I'm rich. No, if I'm poor. Want it so much! 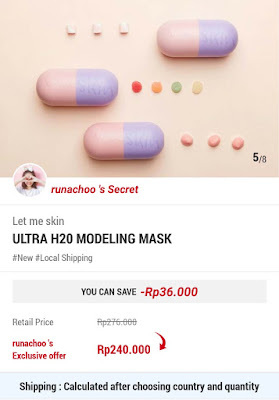 Where can I buy Let Me Skin Ultra H20 Modeling Skin? You can buy it from my store : hicharis.net/runachoo. It ships worldwide from South Korea! Good news for Indonesia residence, you can pay with COD system and could get local shipping! If you buy in my shop at hicharis.net/runachoo, you will get 13% discount and only need to spend $ 15.88 to get Let Me Skin Ultra H20 Modeling Mask! You can get other varieties too! USD, CNY, SGD, THB, PHP, MYR, IDR, VND, and TWD. Payment is available from credit card to local payment and COD. Like Indomaret (minimarket) in Indonesia, or pay from BDO in Philippines. 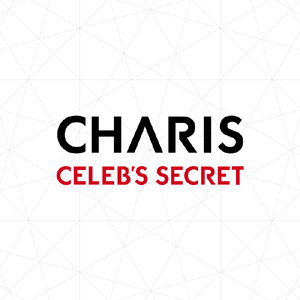 You also get a $ 5 credit for new registration in hicharis! Get your multiple discounts at once! Ah-choo! I'm Ruby! An unique creature that lives on Saturn. 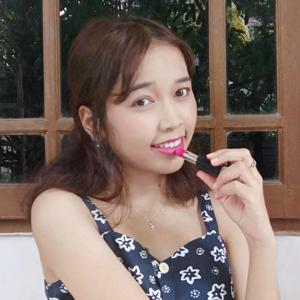 A Beauty Blogger based on Bogor, Indonesia. 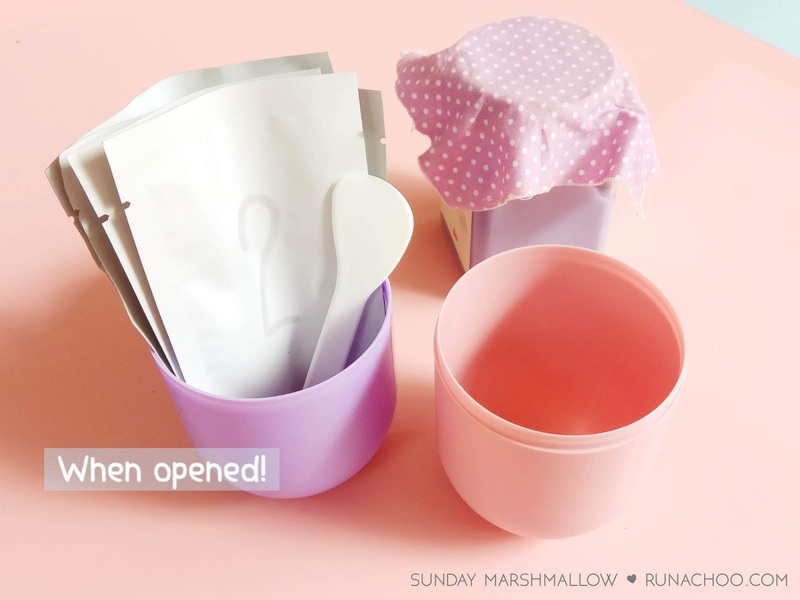 I wanna make your days warm and sweet like Marshmallow by reading my blog! Korean products to shop and pay less by shopping at my store! Shipped world wide. Start shopping by clicking the picture above! 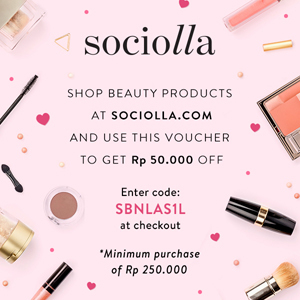 Start shopping by clicking on the picture above and pay less using my discount code : SBNLAS1L.